As you may know, Bunny doesn’t have a cage and probably won’t ever have one again. However, we are going on vacation soon and our good friend is going to take care of Bunny while we are away. She has a small dog that will be with her at times and while Bunny and the dog have gotten along fine in the past and won’t ever be alone together, the dog’s playfulness is sometimes a bit too much for Bunny and he gets annoyed. So we decided to build him a fort with a door small enough for Bunny to hop through, but not the dog. We are sharing the idea, because it’s easy to make and could have a variety of uses. At first we thought of making it out of wood, but a trip to the home improvement store quickly convinced us to re-think that idea. The wood, wire, and other small parts would have totaled more than $100. Not ideal! After a few days the glaringly obvious solution presented itself: PVC pipe. These days people make all kinds of things out of PVC pipe. Toys, furniture, backdrop stands, presentation walls, clothing racks, and more. Why not a rabbit fort? Since this is only a fort and not a cage, we made it to be 2’x5′. 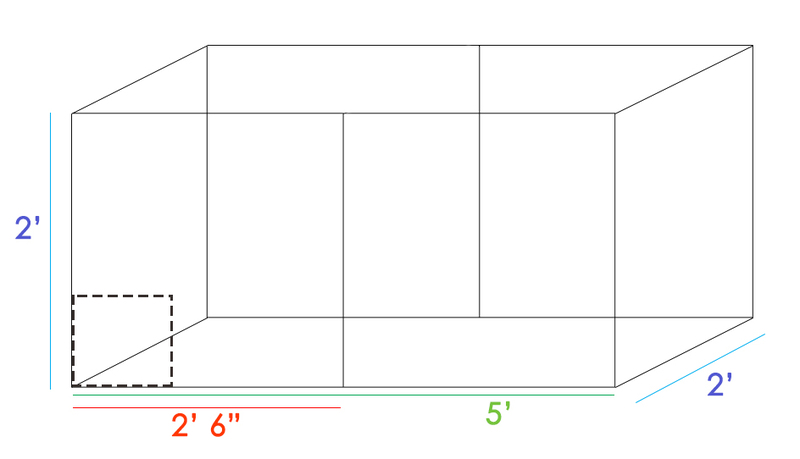 It’s also 2′ high, because that was the height of the wire and we simply went with it. 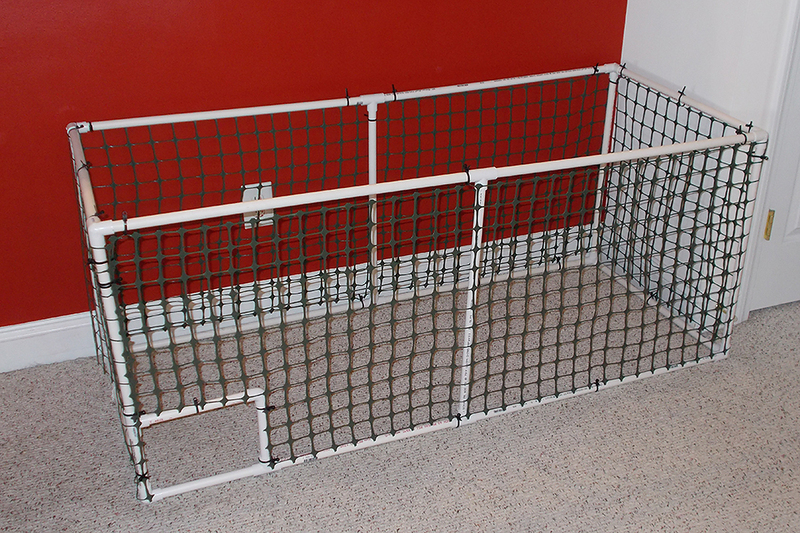 We picked plastic wire fencing and zip-ties to attach it to the PVC and our design is a fort with an open door, but you can turn it into a playpen for inside or outside and even an indoor cage with few alterations. If you do plan to use it as an indoor cage or have a little chewer, I would recommend going with metal wire instead of plastic and metal twist or cable ties. 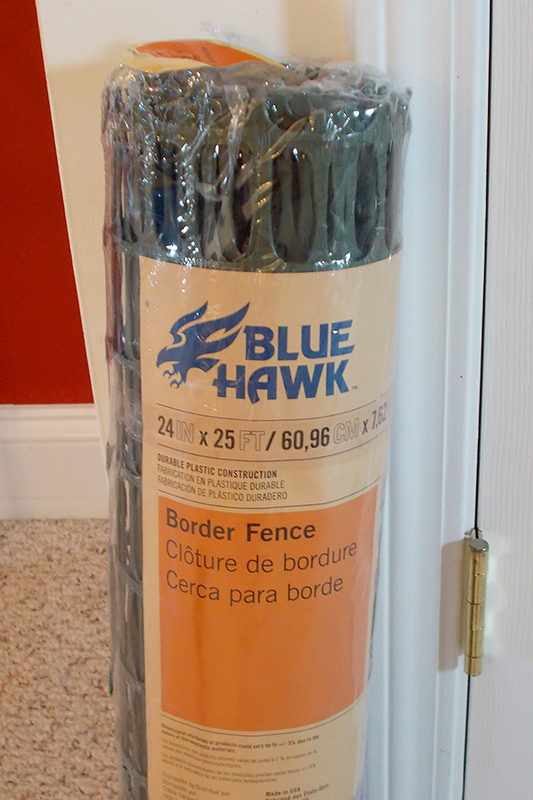 You may also want to switch to thicker PVC pipes (we used 1/2″ ones). If the rabbit chews on the PVC pipe, this will unfortunately not be a good solution for you . Here is the initial design. We needed 26′ of PVC cut up as follows plus 15 fittings. Also make sure you have a 100 pack of 8″ cable ties. We bought 3 pieces of pipe, all of which were 10′ long with a diameter of 1/2″. Cutting them up was easy with a tape measure, a sharpie, and a simple coping saw. Then we pieced everything together and altered a couple of pipes slightly to create the door. This took maybe 1 hour of work. We left the structure standing for a few days, so Bunny could get used to it. 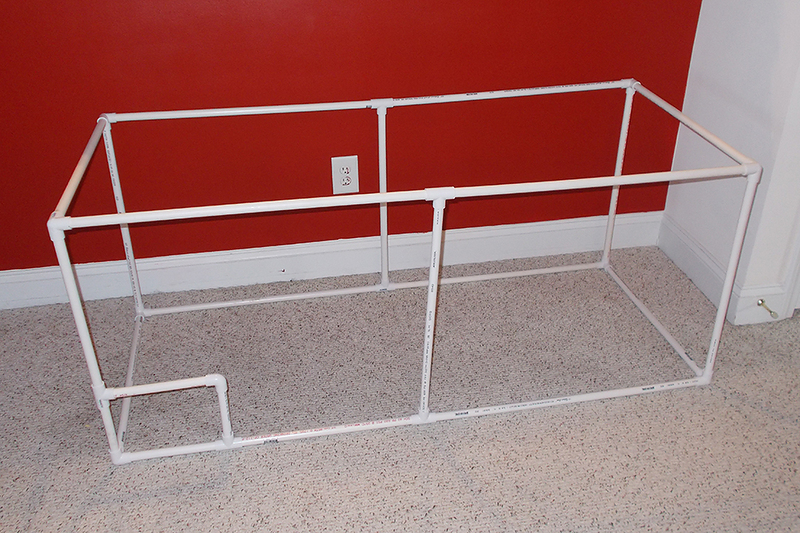 When it was time for the wire fence, we loosely attached the top part of the wire to the PVC pipe with the zip-ties. We rolled it all around the structure, always attaching the zip-ties to the top and corners to secure it. We cut off the excess wire on the side and in front of the door, which was easy with regular scissors. Now we attached zip-ties loosely to the bottom of the structure and eventually zipped all of them up tightly. Bunny supervised the project and seemed to approve our methods. 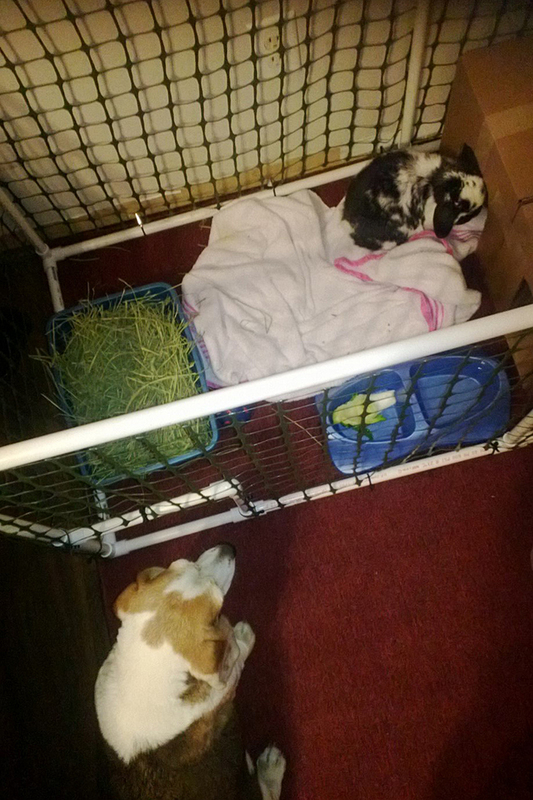 It’s certainly not the prettiest thing in the world, but Bunny will be able to seek privacy when he needs it. His hay, food bowl, and litter box will also go in there while we are gone to make sure the dog has no access to it. It cost about $35 (the fittings were the most expensive part) and took maybe 90min. of labor. Without the door this would be great to take outside if you have a backyard that isn’t fenced in, but want your rabbit to be able to eat fresh grass and hop around. Always supervised, of course. UPDATE: The fort worked out really well for us while on vacation. Our friends didn’t say anything about the giant PVC thing we brought into their home (although they probably wanted to) and it proved to be a great place for Bunny to get away from the very friendly dog when he had enough interaction. Of course they were supervised at all times anyway and the dog was only allowed to visit for short periods of time. Here is a picture of the fort in use. As you can see, we also made a little cardboard hideout for privacy. Ha! Karen, Thank you very much for the comment! We decided to go with plastic, because Bunny doesn’t chew things. I have no doubt that he could, but he just won’t. We built it for him to have privacy when he needs it, not to contain him. We used to have baby gates in front of the office, too, and he completely accepts them without trying to chew through them. But we appreciate your concern! Due to shedding allergies of other members of my family, my bunny, Stitch, has to be in a hutch or cage. :( I was wondering if their was a cage/hutch you would recommend, even though your bunny is free range? I am able to keep him indoors or outdoors, and I just wanted to make sure he was as happy as a rabbit could possibly be with a hutch/cage!